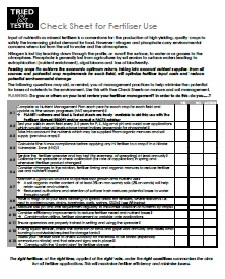 Useful check sheets for Fertiliser, Soil & Manure management. 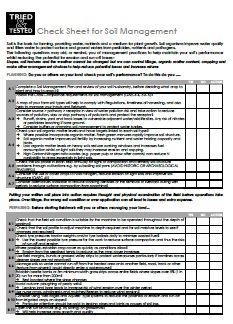 Use in Farm Office for planning & preparing and in the tractor cab during field work. Input of nutrients as mineral fertilisers is a cornerstone for the production of high yielding, quality crops to satisfy the increasing global demand for food. However, nitrogen and phosphate carry environmental concerns when lost from the soil to water and the atmosphere. Nitrogen is lost by leaching down through the profile, or runoff from the surface, to water or as gasses to the atmosphere. Phosphate is generally lost from agriculture by soil erosion to surface waters leading to eutrophication (nutrient enrichment), algal blooms and loss of bio-diversity. Feeding crops to achieve the economic optimum return, taking into account nutrient supplied from all sources and potential crop requirement for each field, will optimise fertiliser input costs and reduce potential environmental damage. 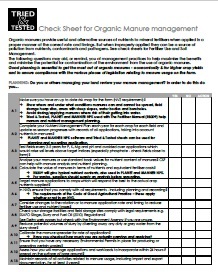 Organic manure provides useful and alternative sources of nutrients to mineral fertilisers when applied in a proper manner at the correct rate and timings. But when improperly applied they can be a source of pollution from nutrients, contaminants and pathogens. Soil is the basis for farming, providing water, nutrients and a medium for plant growth. Soil organisms improve water quality and filters water to protect surface and ground waters from pesticides, nutrients and pathogens. Slopes, soil textures and the weather cannot be changed but we can control tillage, organic matter content, cropping and make other management choices to help reduce potential losses and increase returns.